On the morning of October 31, 2014, Virgin Galactic’s SpaceShipTwo crashed during a test flight 25 miles north of the Mojave Air and Space Port, killing one of the two pilots flying the craft. "Space is hard and today was a tough day,” said Virgin Galactic CEO George Whitesides at a press conference held a few hours later. Hundreds of wealthy would-be space tourists have put down deposits for a $250,000 rocketship ride into the edge of space, with Virgin Galactic's flights scheduled to begin as early as 2015. The tragedy capped a tumultuous week for private space ventures, with the explosion a few days earlier of an unmanned Orbital Sciences rocket just moments after takeoff from Wallops Island in Virginia. Investigations are ongoing into the cause of both accidents. For more information, read the KQED News Fix blog post. In May 2012, SpaceX became the first company to make a commercial mission to the International Space Station, successfully ferrying more than 1,000 pounds of supplies to the station. But SpaceX’s founder and CEO, billionaire entrepreneur Elon Musk, has a larger prize in mind: flying people to Mars aboard SpaceX rockets within 10 or 15 years. Meanwhile, Virgin Galactic, founded by billionaire British entrepreneur Richard Branson, is on track to launch its first commercial spacecraft next year, rocketing “space tourists” on a $250,000 ride to the edge of space. So far, the company has collected deposits from more than 600 passengers, including wealthy children of the space age and celebrities like Justin Bieber and Leonardo DiCaprio. Today's space exploration efforts look far different than the historic exploration of space pioneered by NASA during the Apollo missions of the 1960s and '70s. Then, during the height of the Cold War, the US locked technological and ideological horns with the Soviet Union to prove that American ingenuity and technological prowess would triumph in the race to land a man on the moon. But now, in the age of cutbacks and federal furloughs, NASA is turning to the private sector to more cheaply get to Low Earth Orbit, a region roughly 100 to 600 miles above earth where the International Space Station is located. From space tourism to plans to mine the moon, dozens of for-profit companies, many with the business models, characters and the high-tech, risk-taking culture of Silicon Valley, are reshaping American space exploration. Stanford Aeronautics Professor G. Scott Hubbard, who worked at NASA for 20 years, and served as the director at one of its centers, the NASA Ames Research Center, said the space agency's growing partnership with the private sector is critical for America to work more efficiently and cheaply in space. "In the old days, with all of these specifications, the reviews would get down to every nut and bolt," he said. "In this new age, now, in 'new space', companies like SpaceX, like Orbital Sciences, are building their own vehicles, and NASA is saying, 'OK, if you give us a service meeting this type of a milestone and this level of reliability, we’ll just take it...we're not going to investigate every nut and bolt.'" But the private sector isn't simply providing lower-cost services to NASA. More fundamentally, it is disrupting the space industry by creating new technologies that make getting into space cheaper. And that is expanding the commercial, scientific and even extreme adventure possibilities of space. Many of the country’s new space entrepreneurs hail from the tech sector and some, like Elon Musk, rocketed to prominence with startup success in the early days of e-commerce. Clearly, there are risks associated with these new, for-profit space ventures. Not only does the threat of commercial failure loom large, so too is the threat of accidents aboard the rocket ships gearing up to fly wealthy thrill-seekers and space buffs dozens of miles above earth. "If we fly in space often enough, people will die. That's not a pleasant truth but it is the truth," said Jeff Greason, CEO of XCOR Aerospace, a Mojave, California company that, like Virgin Galactic, is also accepting deposits for rides aboard its rocket ship. Tragically, this sentiment became reality on Oct. 31, 2014, when Virgin Galactic’s SpaceShipTwo crashed during a test flight, killing Michael Alsbury, a Scotts Valley native and one of the two pilots on board. The disaster came just three days after the explosion of an unmanned Orbital Sciences rocket in Virginia. The rocket was scheduled to make a resupply mission to the International Space Station, as part of NASA’s Commercial Crew and Cargo program, under which the company, along with its competitor, SpaceX, had won lucrative, billion-dollar contracts to haul cargo to and from the ISS. Hubbard said the disasters occurred in two different areas of the private space sector, so the impact of the crashes should be examined separately. Hubbard served as the sole NASA official on the investigation into the February 2003 crash of the Space Shuttle Columbia, which killed all seven crew members. He said he thinks that the crash of SpaceShipTwo will not derail the launch of space tourism, adding that the risks are not unlike those of the early days of aviation. As Orbital Sciences and Virgin Galactic struggle to move on from their setbacks, other private space companies have seen major successes in recent months. 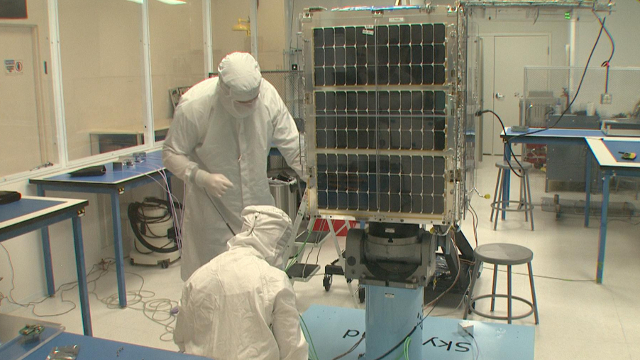 Technicians at Skybox Imaging work on a satellite in a clean room at the company's headquarters in Mountain View. Image by Blake McHugh. Skybox Imaging, based in Mountain View, sees itself as building "the iPhone of satellites.” The company is carving out a new niche in the satellite imaging industry with lower-cost imaging satellites that are built with the latest computer processors to transmit rapid satellite imagery and video of practically any location on the planet, said the company's co-founder and executive vice president, Dan Berkenstock. The potential applications include monitoring deforestation activity to tracking shipping activity in a busy California port, from day-to-day and month to month. Skybox says its customers will be able to access online current satellite imagery of locations they're interested in tracking for presumably a lot less than the "couple of thousand dollars" that Berkenstock said it costs today for a customer to order a new satellite image and receive it months later. The trade-off, however, is quality: although Skybox's satellites will provide high-resolution images, they won't be as sophisticated as what the SUV-sized, expensive imaging satellites can provide. "We can count how many cars are in a parking lot, but we probably can’t tell you it’s a Buick versus a Honda," said Berkenstock. The company launched its first two satellites from rockets in Kazakhstan in November 2013. In August 2014, Google acquired Skybox Imaging for $500 million.